Many times, there are vast swings in quotes for swapping out the front door. Amounts are variously balanced against the impression the door makes and the security and protection that it provides. Single, basic security doors are suprisingly among the most inexpense. A 32" steel skin entry door, in a 32" prehung design, complete with outer brick mould can be installed for as little as $250 to $375 on a trouble free site (34" 1/2 x 82 1/2" rough opening) plus the handle and deadbolt ($35 minimum) and painting (typically primered). Add to this, any factory pre-finishing (about $180) or for decorative glass features besides fitting the casing to match on the inner side. Specialty metal finishes such as a zinc or iron will cost extra. For those willing to invest more, either by design/make or for a material upgrade, prices quickly rise as they will also for accomodating a wider rough opening. Priced higher than metal, a fiberglass door with decorative sidelites to fit a 64 1/2" width opening start at around $1,150 with hardware for an economical home center brand and approximately $250 plus for the install - including removal of the old door and its disposal. Expect to pay more for mid-grade lines and brands like Anderson and Pella along with a host of others. The front door constructed in solid wood, depending on wood species and brand, forms the upper end of the price scale under most scenarios. With installation, bottom line pricing begins near $900 for a solid entry door like alder and mahogony and this goes to over two thousand dollars while among this range are options like distressed finishes, the speakeasy, custom handles/knockers and glass lighting. For customized solutions most solid front doors incur fees anywhere from $3,000 upwards of $9,000 in total. 1 Customer in this case was not charged tax. Custom shapes such as an oval upper arch will add considerably to the bill not only for the pre-constructed door unit but for the hanging which might require reconfiguring the wall section and framing if a typically door was there previously. Often available in designer ends only, ovals with decorative glass can cost upwards of $2,250 plus for a single wide door. Left or right swing doors should be thought out prior to purchase, given the flow of foot traffic. Doors have inner cores and seals that range in their insulating value. Check to see if a prospective door is Energy Star qualified. Also, having thresholds properly equipped gives the future opportunity for making threshold adjustments to close drafts and render air tightness as a result of movement. Normally, overhead light transoms come at an extra charge that requires a taller rough framing which may or may nor be in place. 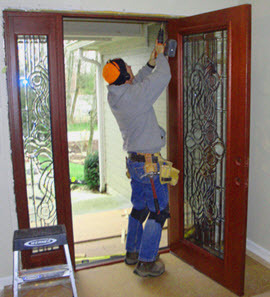 Many wood doors require maintenance unseen in other doors, and so incur greater costs of maintaining. They also, as a broad rule, can be more susceptible to changes in shape which can affect their efficiency and look over the longer term. Some more so than others.